To avoid getting bed bugs while traveling, make sure to inspect the mattress and sheets on the hotel beds, especially near the seams, mattress tags, and box spring. If you see any rust​ stains, dark spots, or pale yellow patches, this could be a sign of bed bugs. Also, never put your suitcase on the bed itself or you could bring them home after your vacation. Most hotels provide a luggage rack, which is much wiser to use. 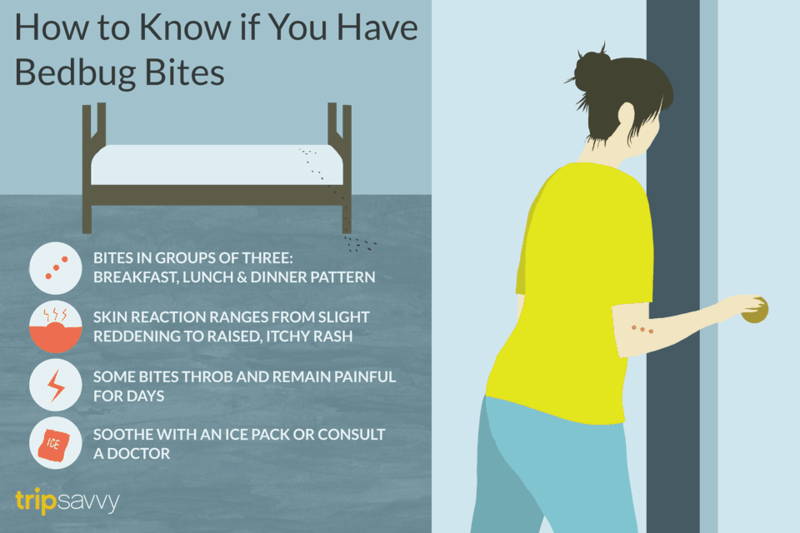 Bed bug bites typically appear in groups of three, called the "breakfast, lunch, and dinner" pattern. Each victim's reaction to bed bug bites is unique. Some may have a slight reddening of the skin. Others may have a more severe reaction, causing a raised, itchy rash. A raised rash may obscure the individual bites, making it challenging to identify. Sometimes, bites and lesions can throb and become very painful for days after the bugs bit you. As a precaution, you can steam, vacuum, and spray rubbing alcohol all over your mattress and box springs. It's also recommended to steam, wash, and dry all the bed linens using hot water and bleach. To clean out your suitcase, spray rubbing alcohol over the luggage, both inside and out. Then, finish the job by vacuumed your bedroom thoroughly. If you believe that you found traces of bed bugs, immediately cover the mattresses and box springs with plastic mattress covers. In worst case scenarios, you'll need to hire an exterminator to come inspect your home. If you got bit by bed bugs, use ice packs to relieve the swelling and itchiness. Go to the doctor if symptoms persist. They will usually prescribe you a dose of antihistamines and antibiotics. Additionally, they may instruct you to bathe multiple times a day and apply a special cream to the rash.